This is a far-reaching law which covers all taxpayers owing more than $50,000 in back taxes. The intent of the taxpayer to leave the country is not a criterion. Nor it is limited to criminal cases, civil penalties are enough. What is NOT classified as a seriously delinquent tax debt? What are the steps of passport revocation by the IRS? It’s not all tax debt that will be enough to revoke a passport. The IRS must complete certain steps before a debt can reach the status of “seriously delinquent tax debt”. For instance, they need to issue a notice of deficiency. Before denying a passport, the Department of State will hold your application for 90 days. They will allow you to either pay your tax debt, resolve a certification issue or enter into a payment agreement with the IRS. If the IRS asked for such an application to be denied when it was the case, either the tax was not owed or it fell in one of the exceptions. That said, this 90 days period applies for applications for new passports. Revocation of existing passports would not be subject to any grace period. How does American abroad reach $50,000 tax debt? While it may seem that the $50,000 is out of reach for most taxpayers, it does include penalties. Both penalties assessed under the Internal Revenue Code. It includes a few $10,000 penalties for failure to file a form 5471 or a form 3520. And the FBAR penalties (also ranging from $10,000 per unreported account to 50% of the account balance), making it easy to reach $50,000. While Congress passed the law in late 2015, it is only since February 2017 that the IRS and the Department of State issued the regulations to allow for the two administration to coordinate the implementation of that law. The IRS has not yet started certifying tax debt to the State Department. Its website states that certifications to the State Department will begin in January 2018. You can check this page to see the current status. A crucial question will have to do with the internal work. I.e., the IRS has to go through in order to identify and certify the tax debt. The IRS has many systems listing tax owing, and information may become stale, not reflecting the current status of a debt. Likewise, after certification, the question will remain on the IRS to properly inform the Department of State. They need to update them once a taxpayer has resolved his/her “seriously delinquent tax debt. Therefore we recommend taxpayers to make arrangements with the IRS. You can establish a payment plan to ensure that they are not flagged as such since removing the “seriously delinquent tax debt” classification might not be straightforward. Prior to revocation, the Department of State will make the passport valid only for travel to the United States. Or it could likewise issue a limited validity passport valid only for travel to the United States. As such, a US citizen will still be able to travel back to the United States. It is still possible to comply, contact us now at 1040 Abroad. 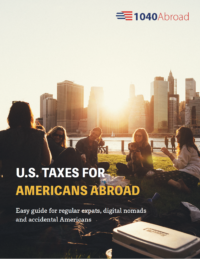 How does tax situation change when a U.S. citizen moves abroad? What about seriously delinquent student loan debt? This law doesn’t include delinquent student loan debt, so it’s fine. But this debt cannot be discharged in bankruptcy. Thanks for posting. People with IRS liabilities below $50,000 should still take note as you say. A liability of $25,000 can quickly grow to over $50,000 if not managed properly. Anyone with concerns about their passport should address the IRS issue no matter the amount.